The Sunstock Solar Executive Producers, in partnership with cARTel: Collaborative Arts LA, are proud to announce the return of the Sunstock Solar Festival. The festival’s new location will be at the Magic Box LA @ The Reef in Downtown Los Angeles on September 9th, 2017. Sunstock Solar Festival impassions, educates and activates both our local and global communities through music, art, food, discussions and more, all centered around building greener cities and greener futures. 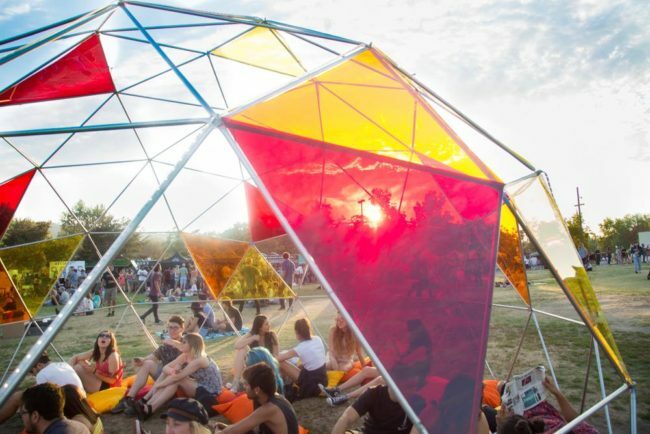 The event will focus on clean energy, sustainability and social justice in a positive, engaging way, featuring solar powered light installations, green food trucks, immersive art, workshops, games, sustainable vendors, social action opportunities and the headlining feature – music powered by the sun. The all ages show intends to engage festival-goers with the causes and calls-to-action that we need to protect our future. This year, for the first time, the event will feature a second stage focused on local acts chosen via submissions. Also this year, the executive team is joining forces with returning partner GRID Alternatives to help foster a brighter solar future in Los Angeles in the vein of last year’s partnership with Kids Cancer Connection. For 2017, the festival will raise funds directly for GRID to support their mission of providing clean energy to those who need it most. Please visit Sunstock Solar Festival for complete details, along with submissions to participate as a visual artist or vendor.